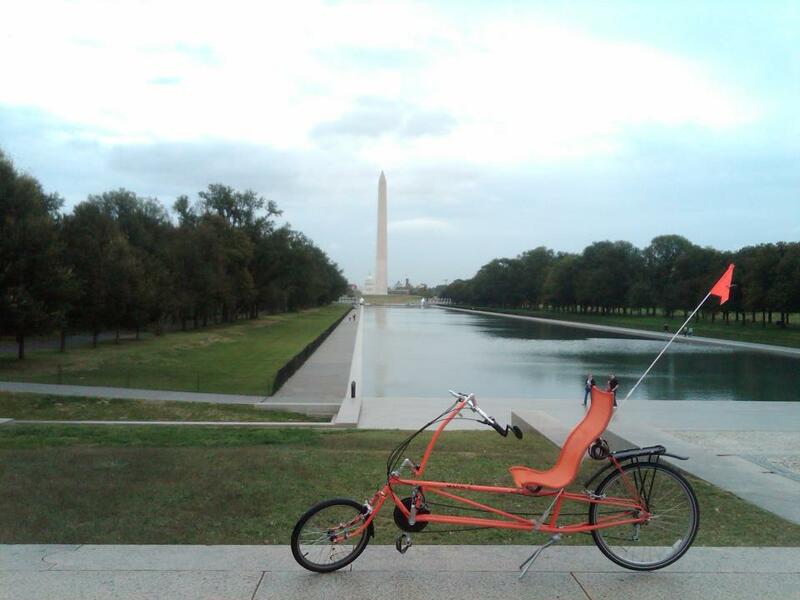 It has rained, and occasionally stormed, every day for the past couple of weeks here in D.C. And as indicated by the ominous-looking skies in the background of the photos from this bike ride, it rained again today. But I haven’t let that keep me from my lunchtime bike rides. 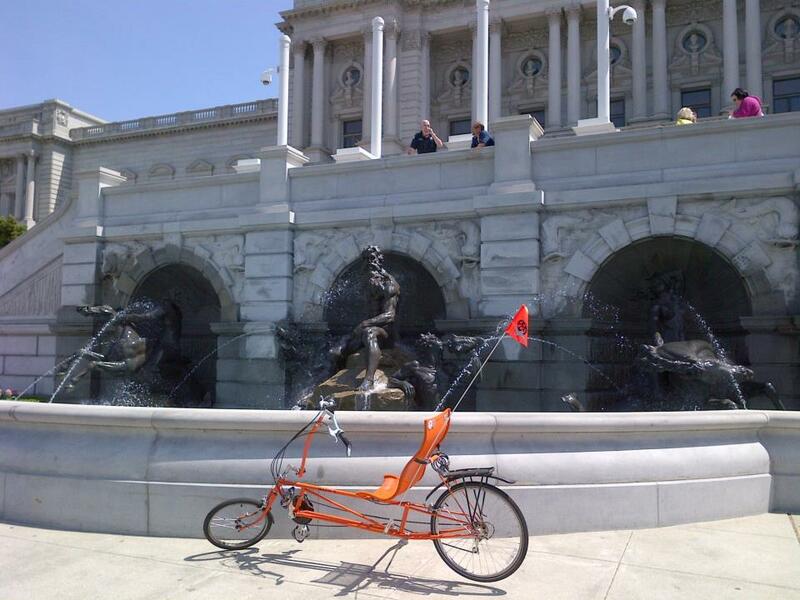 And on this ride, I went to see the Christopher Columbus Memorial Fountain, located in the middle of Columbus Plaza (MAP), in front of Union Station in northeast D.C.’s NoMa neighborhood. The fountain, also sometimes referred to as the Columbus Monument, is a memorial to Christopher Columbus, the Italian explorer, navigator, and first colonizer of the Western Hemisphere or “New World.” It was designed by American sculptor Lorado Zadoc Taft, a distant relative of President William Howard Taft, in collaboration with architect Daniel Burnham. 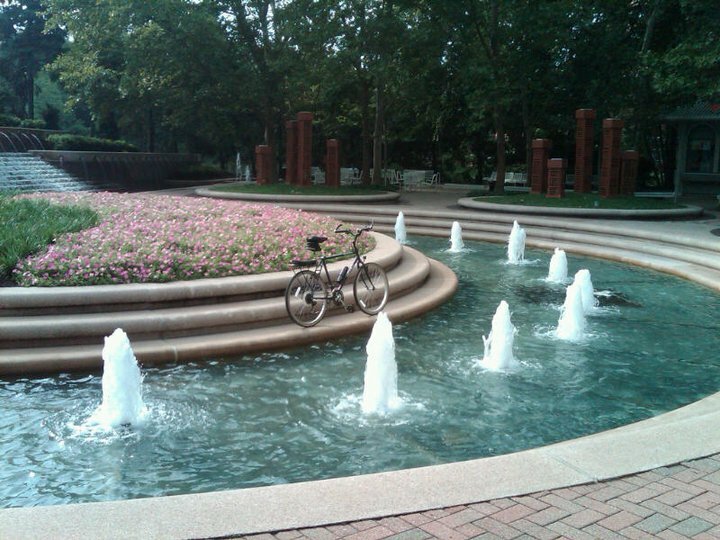 It is a semicircular double-basin fountain with a shaft in the center. 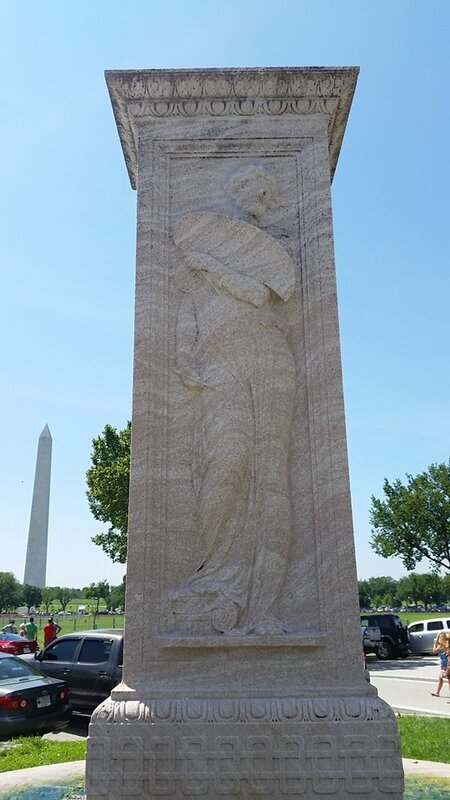 The front of the shaft bears a full-length portrait of Christopher Columbus staring south toward the U.S. Capitol Building with his arms crossed in front of him. 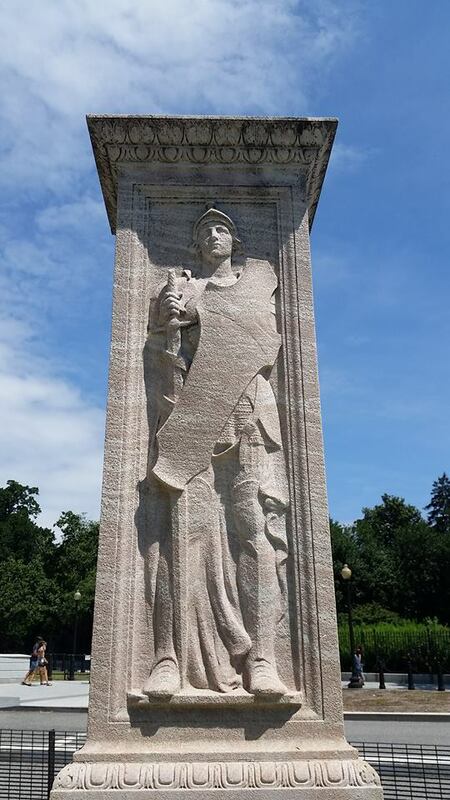 He is flanked on his right side by an American Indian, who is facing west, representing the “New World.” On Columbus’ left side is an elderly man facing east, representing the “Old World.” In front of the shaft is a ship prow that features a winged figurehead leading the way. That represents “discovery.” And above Columbus is a globe representing the Western hemisphere, with four eagles, one on each corner connected by garland. Two lions, placed away from the base, guard the left and right sides of the fountain. 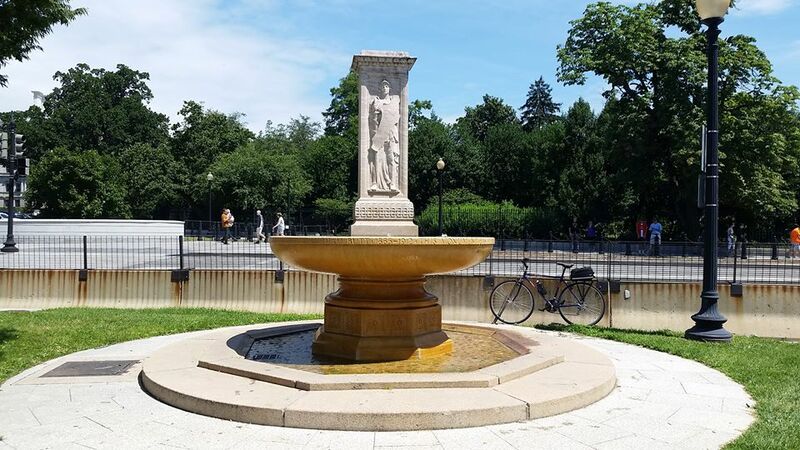 In a day the New York Times referred to as “second only to the inauguration of a President,” the fountain was publicly unveiled in a dedication ceremony and parade on June 8, 1912. After the Knights of Columbus’ successful lobbying for the sculpture which had begun a half a dozen years earlier, the festivities at the dedication ceremony included approximately 50,000 members of the organization. The ceremony was presided over by then Secretary of State Philander Knox, with invocation given by Father Thomas Shahan, the Rector of The Catholic University of America. Other notable participants included Italian Ambassador Cusania Confalonieri, Apostolic Delegate to United States Archbishop Giovanni Vincenzo Cardinal Bonzano and other Catholic Church notables, as well as President Taft. It also included 15,000 troops, 2,000 motor cars, a 21 gun salute, and elaborate horse-drawn floats depicting noteworthy incidents in Columbus’ life. And it was all viewed by around 150,000 spectators. 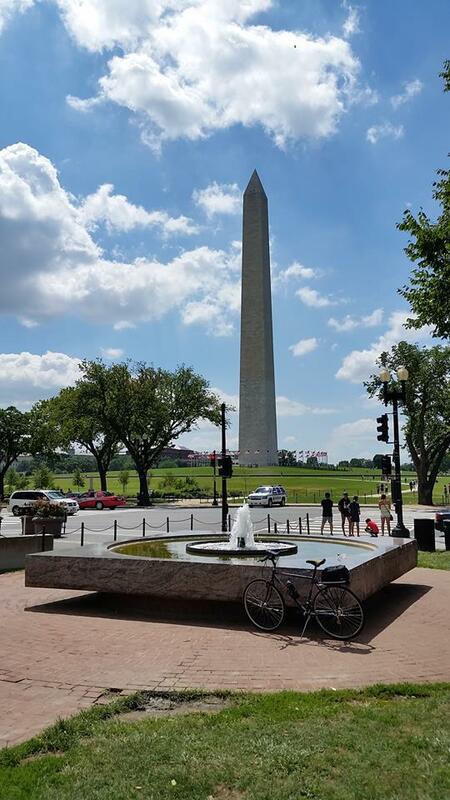 During his formal address at the dedication ceremony, President Taft said, “It is most difficult for us by any effort of the imagination to take in the problem which Columbus solved.” And as I visited the fountain today, I contemplated that statement. In this age of technology-assisted navigation and easy travel, it is almost impossible to fully comprehend the both the difficult conditions and the uncertainty of the outcome of Columbus’ journeys. Not only did he not have GPS or satellite imagery, Columbus didn’t even have a map. That’s because no maps existed at that time of where he was going. All he had was a compass and an astrolabe. His boat actually started to fall apart on his first voyage. They nearly ran out of food and water, facing starvation and dehydration. In fact, Columbus wrote in his diary in 1492, “We ate biscuit which was a powder swarming with worms. It smelt of rats. … We ate sawdust from the boards.” They also faced the threat of many diseases, and many people died on the ship. They encountered severe storms and weather challenges as well. And with all these problems, his crew not only wanted to turn back, they wanted to kill him. So next time you’re headed through Union Station or Reagan National Airport on your way somewhere, stop and think about how good you’ve got it. 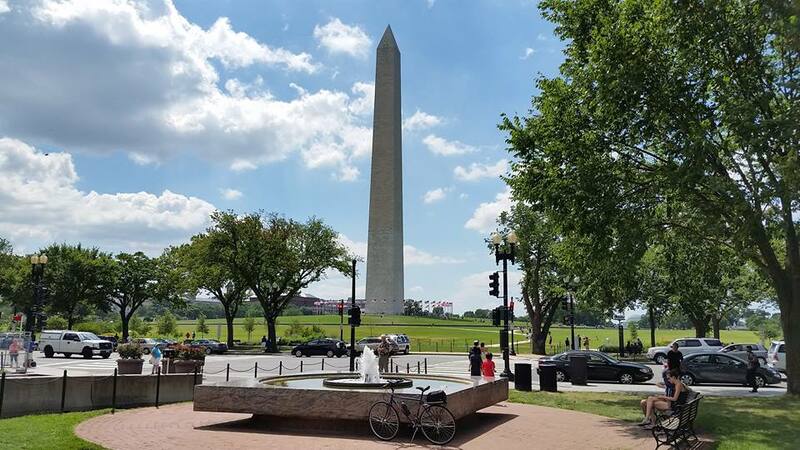 Of all the monuments, statues, memorials, and other interesting places and events in D.C., some of my favorite destinations on my lunchtime D.C. bike rides, especially during the warm months of summer, are public fountains. And there are many of them in the National Capitol City from which to choose. 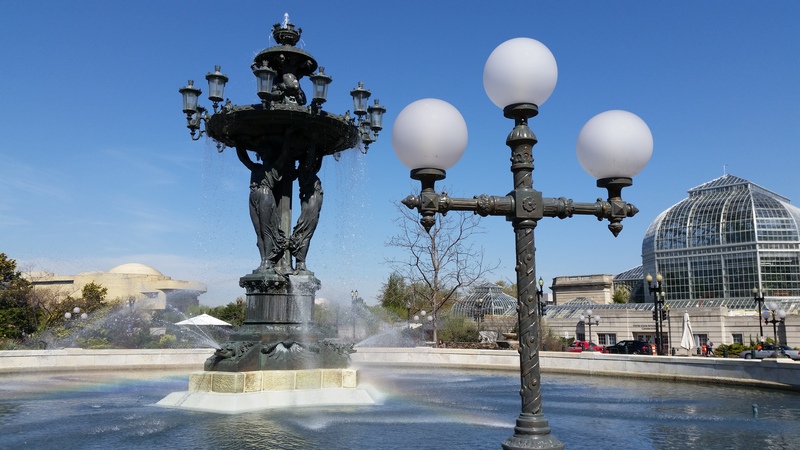 One of the most famous is officially named “Fountain of Light and Water,” but is more commonly referred to as the Bartholdi Fountain. 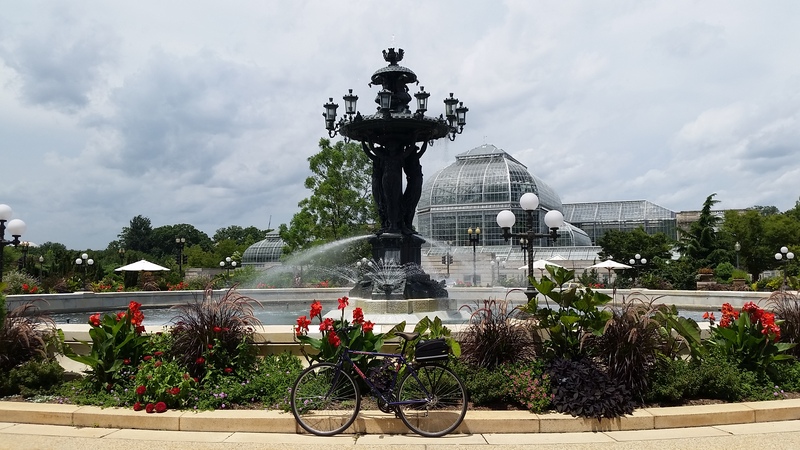 Located at the corner of Independence Avenue and First Street (MAP) in The United States Botanic Garden in southwest D.C., it was the destination for this ride. 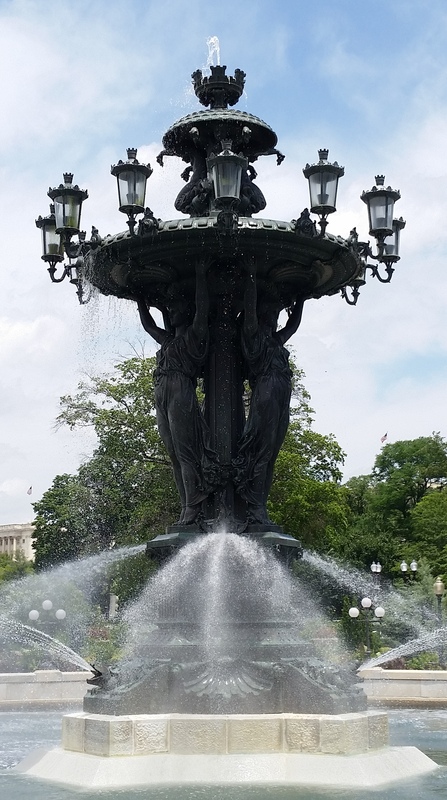 The fountain is referred to as The Bartholdi Fountain because it was created by Frederic Auguste Bartholdi, the French sculptor who is best known for designing the Statue of Liberty. 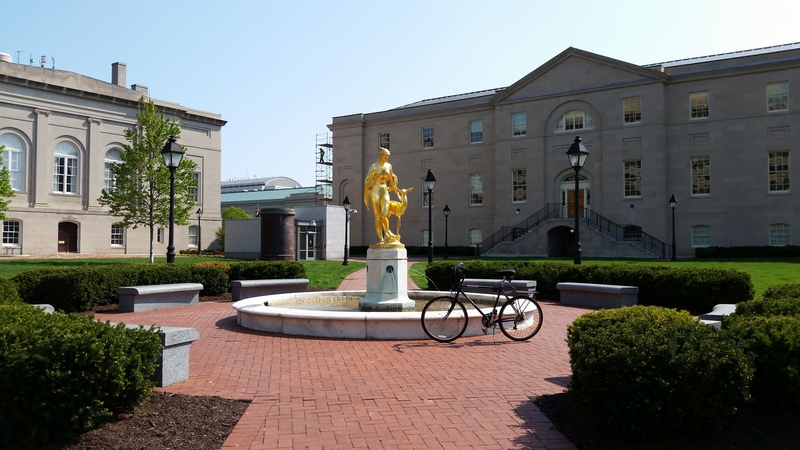 The fountain is based on Classical and Renaissance sculpture, and is composed of a series of basins, supported by sculptures of classical figures. The fountain was cast in Paris by A. Durenne Foundry, and the cast iron is coated with bronze. Standing in the center of a circular marble pool, the fountain weighs 30,440 pounds, stands 30 feet high, and has three caryatid figures 11 feet in height. 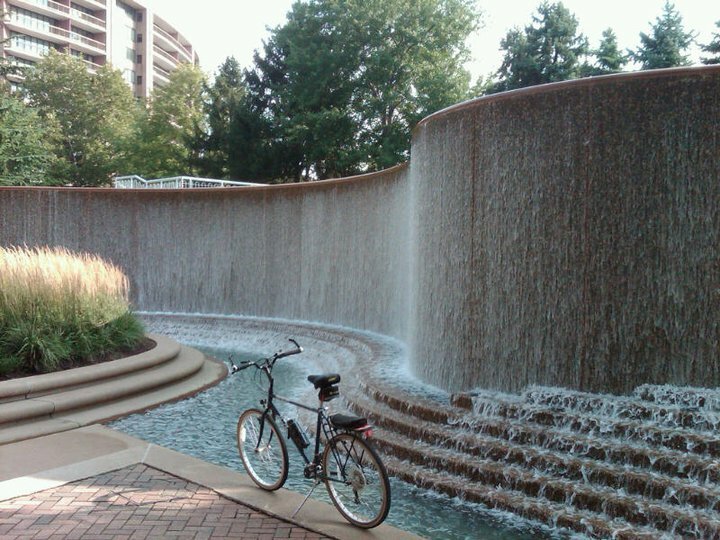 The three-level fountain is topped by a mural crown resembling a crenellated city wall. Water spills from the crown over three youthful tritons playfully holding seaweed and splashes into the upper basin. Twelve lamps surround the basin. The crown appears to be held by caryatid figures depicting nereids, or sea nymphs, standing on a triangular pedestal with an ornamental design of seas shells and coral. 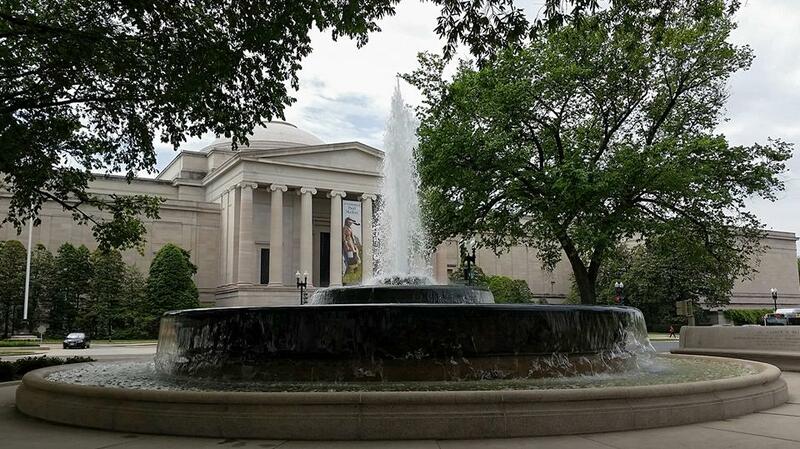 Three reptiles are positioned at the pedestal’s corners, and spout water while supporting the fountain’s lower vasque. Water spouts from a crown at the top, cascades down into the smaller vasque, and then down into the larger vasque before spilling into the main basin. 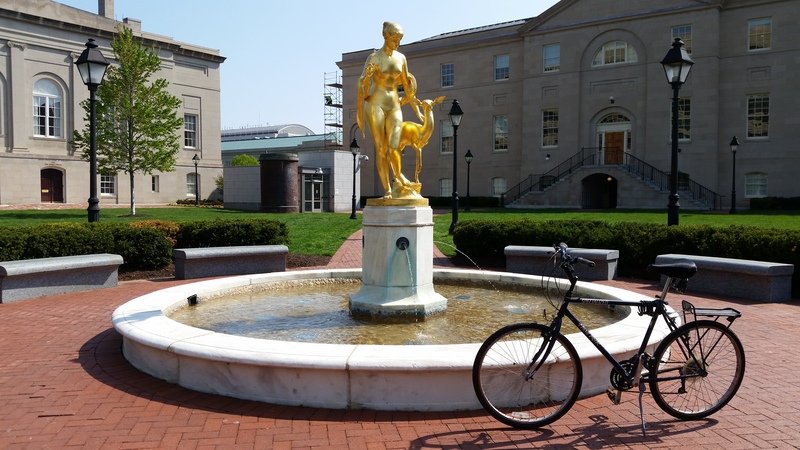 The cast-iron fountain was made for the first official World’s Fair in the United States, also known as the Centennial Exposition, which was held in Philadelphia in 1876 to celebrate the 100th birthday of the United States. After the conclusion of the Centennial Exposition, Bartholdi offered the statue for sale for $12,000. However, he could not find a buyer. 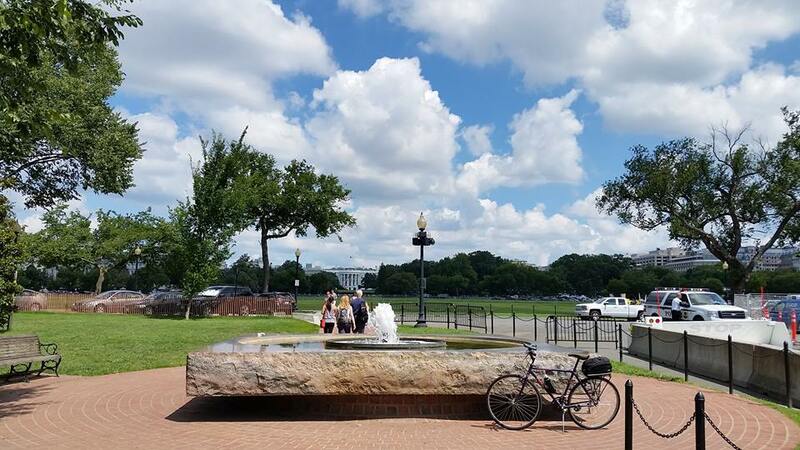 The following year, at the suggestion of Frederick Law Olmsted, the famous landscape architect who designed the Capitol Building grounds, the U.S. Congress offered him $6,000 for the fountain, half his original asking price. 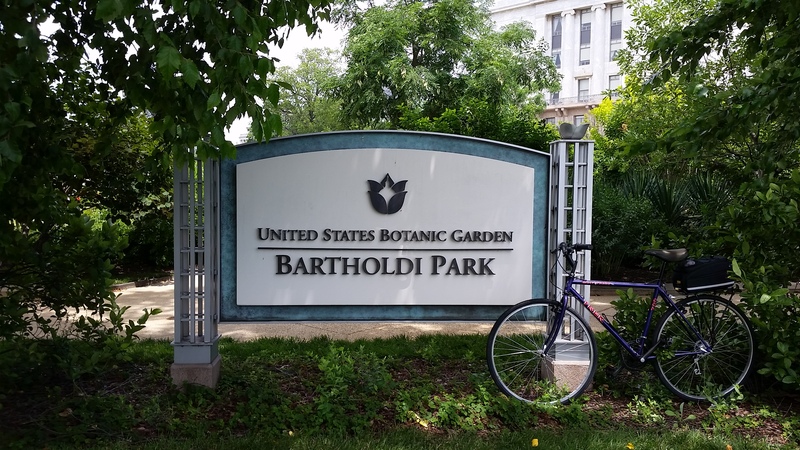 Bartholdi begrudgingly agreed, and in 1877 the fountain was placed at the base of Capitol Hill on what used to be Botanic Garden grounds. 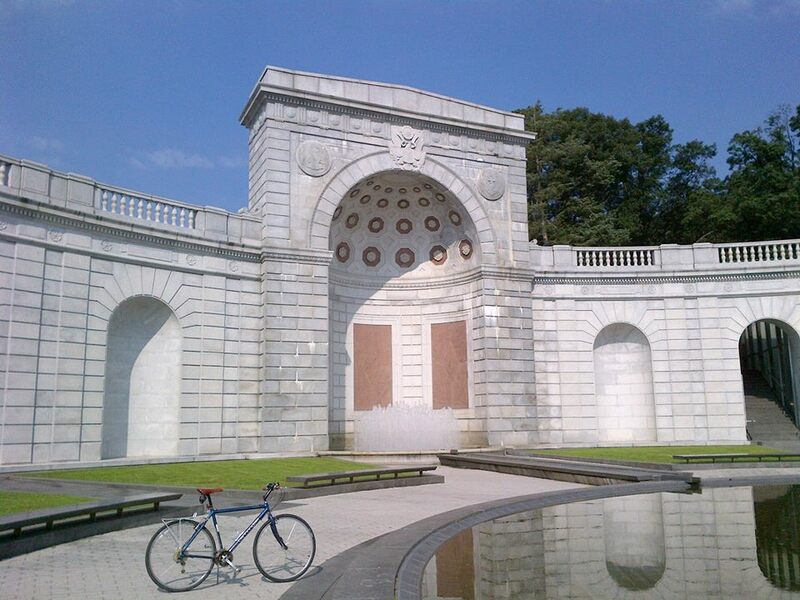 It was removed and placed in storage in 1926 in order to facilitate completion of The George Gordon Meade Memorial, and for landscaping improvements around the Ulysses S. Grant Memorial. 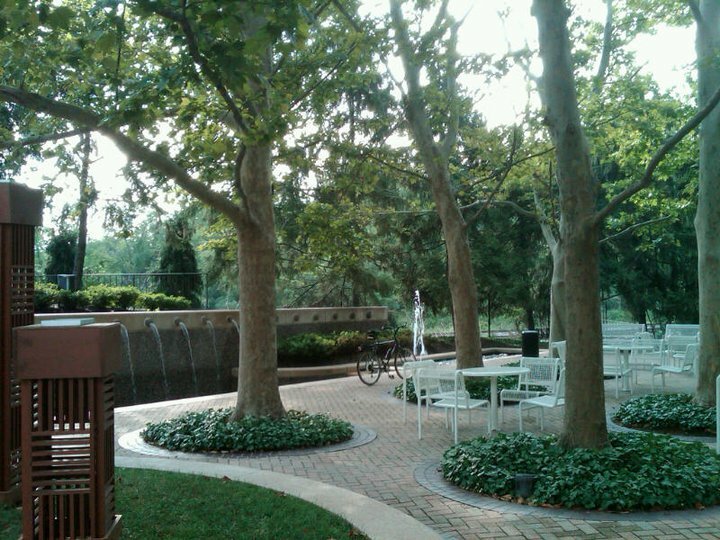 Then in 1932, the sculpture was placed at its current location in the United States Botanic Garden, within the grounds of the United States Capitol Building. 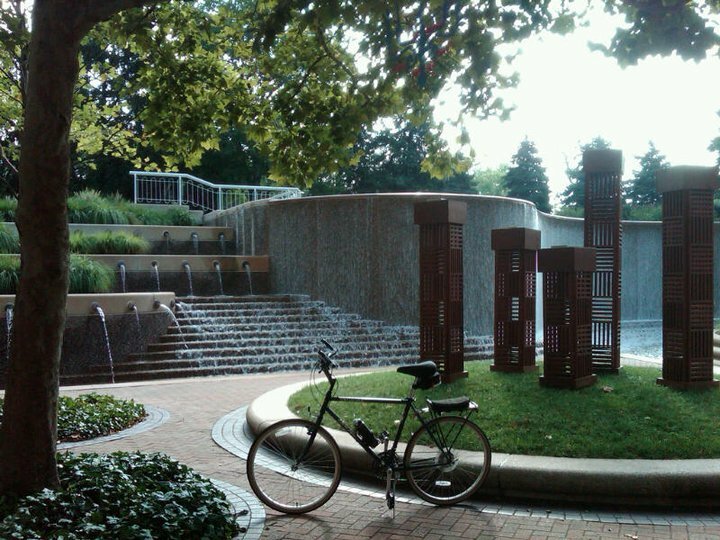 Since the bike rides I write about in this blog take place during my lunchtime breaks at work, I did not visit the fountain at night. But if you are in the city after dark, I highly recommend a visit because to really appreciate the beauty of the Bartholdi Fountain, you’ll need to see it when the cascade of water is illuniated after the sun sets. 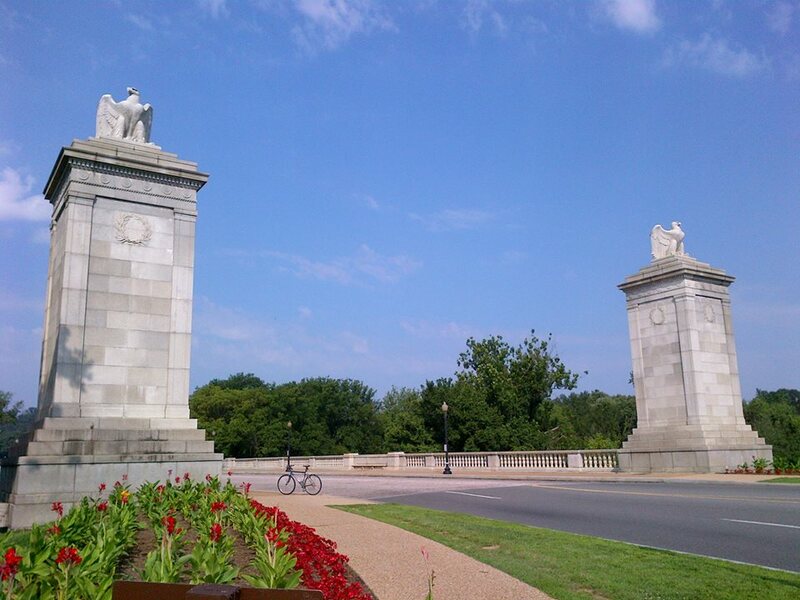 Originally designed and fitted with gas lamps, it was one of the first monuments in D.C. to be lit at night. Other than the fact that the lamps were later converted to electricity in 1915, the Barholdi Fountain remains the same popular evening destination that it has been since the 1880s. 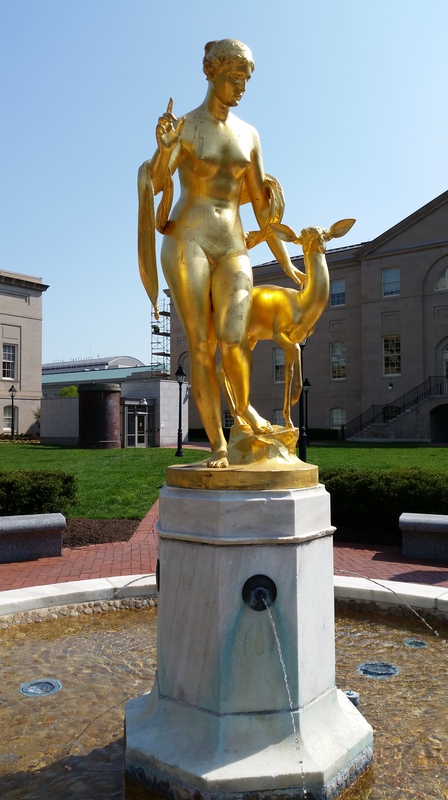 The Court of Neptune Fountain is a lavishly ornate fountain with a group of bronze sculptures, which was partly inspired by the popular 18th-century Trevi Fountain in Rome, and created in 1898 by American sculptor and painter Roland Hinton Perry. 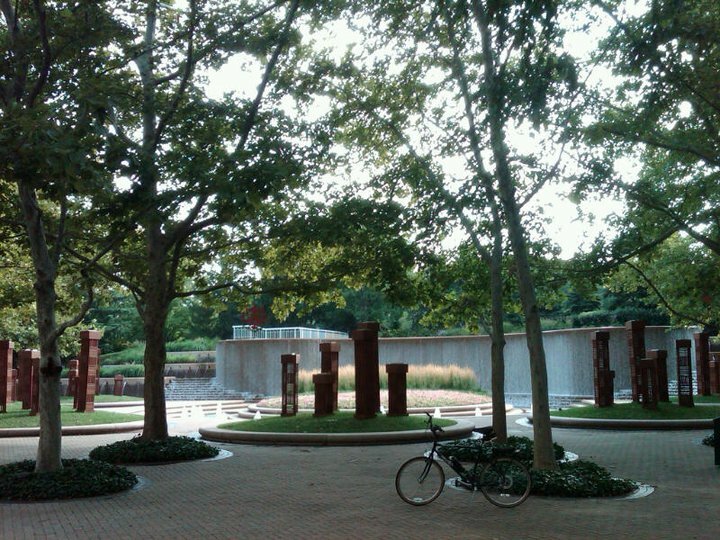 If you look carefully, you can see that the artist’s name and the date he completed the work are inscribed to the right of Neptune, just at the fountain’s water level. 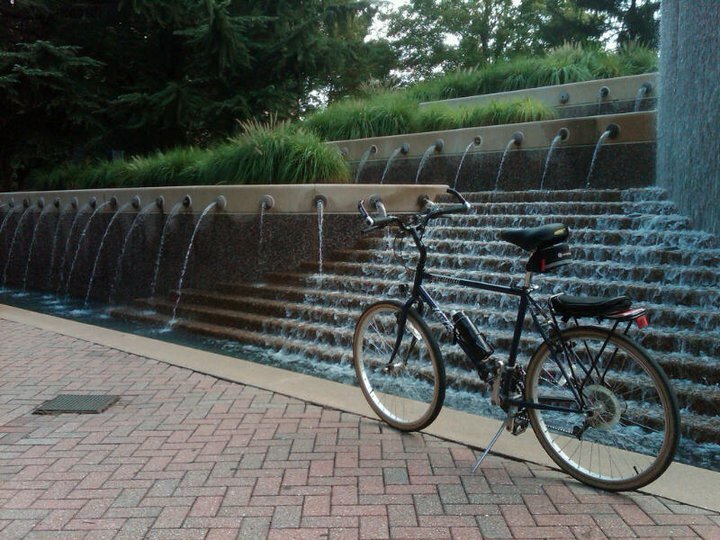 On this bike ride I chose the fountain as my destination. 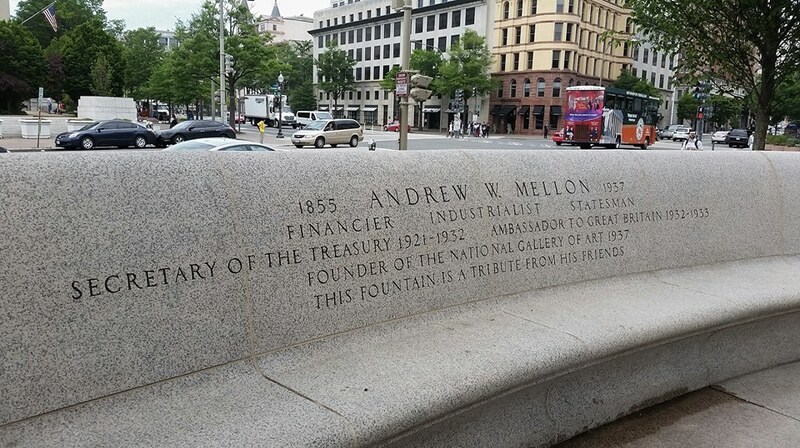 It is located at 10 First Street (MAP) in front of the Thomas Jefferson Building of The Library of Congress in northwest D.C.’s Capitol Hill Neighborhood. 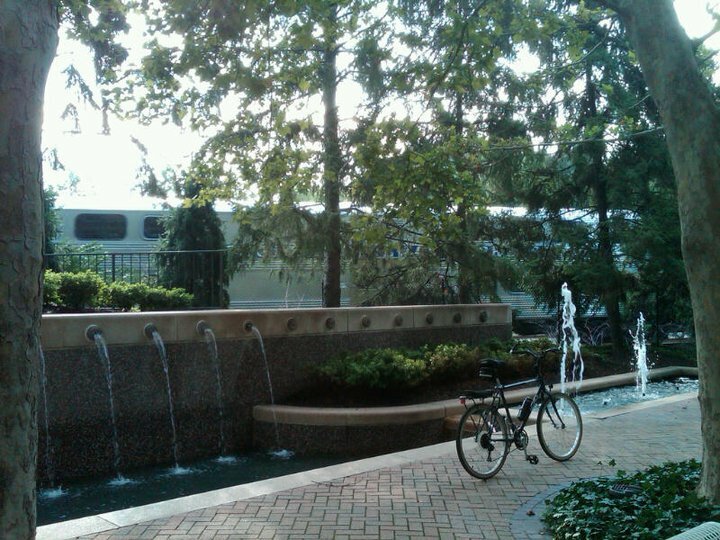 The 50-foot wide Baroque fountain consists of a semicircular granite basin set in a retaining wall flanked by a set of stairs leading into the building behind it. 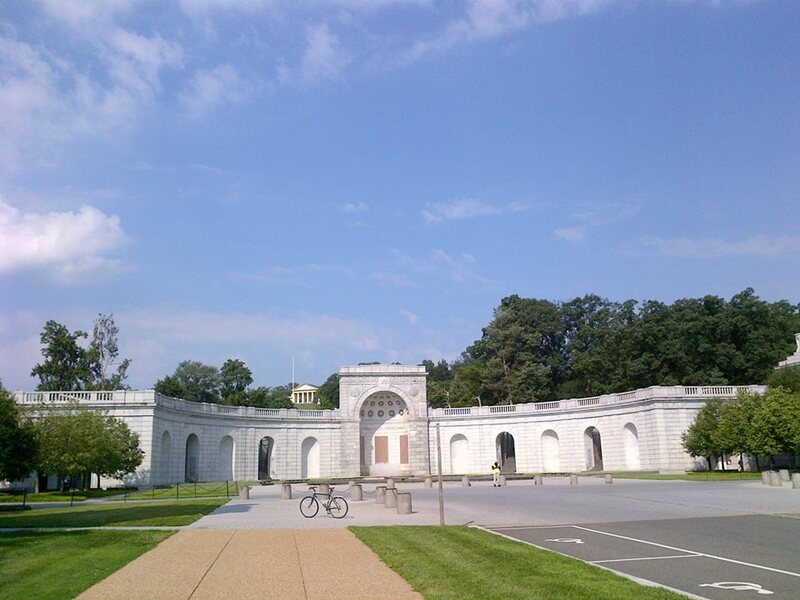 Within the retaining wall, there are three large concave niches which frame the fountain’s statuary of allegorical figures. Front and center in the middle niche is Neptune, the Roman god of freshwater and the sea. He is the counterpart of the Greek god Poseidon. He is depicted with a long flowing beard, and is sitting on a bank of rocks as if on a throne presiding over a grotto of the sea. The muscular figure of Neptune is large and imposing, and would be approximately twelve feet in height if standing. He is flanked on his sides by his sons, the tritons, who are mythological minor sea gods characterized by figures with the torsos of men and the fins of fishes. They are both blowing on conch shells like trumpets, summon the water deities to Neptune’s presence. In the niches to the left and right of Neptune are sea nymphs riding wild sea horses. And in the fountain’s basin are a menagerie of real and mythical sea creatures, including a sea serpent, four large turtles, and two giant frogs all spouting water. On the retaining wall, just above the niches, are detailed reliefs of dolphins and stalactites. This extraordinary and splendid grotto of the sea is worth making the time for. 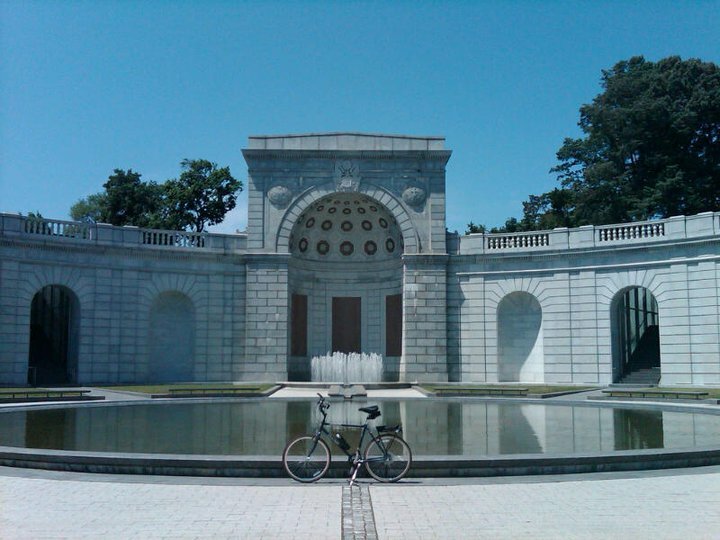 Not only is the Court of Neptune one of the most popular fountains in D.C., it is one of the most elaborate fountains of its kind in the world.